Making these mobiles required a healthy amount of prep, and was a four-step process for the children spanning a period of three days. Yes, it was labor intensive. But in my opinion, very worth it. 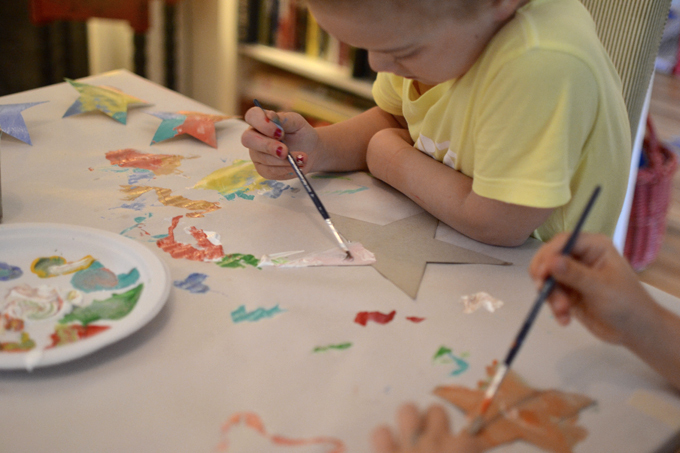 I think multi-step projects can be really worthwhile for children because it allows them to see the organization and planning that goes into artwork, and it also tests their stamina and sticktoitiveness (man, I love that word). 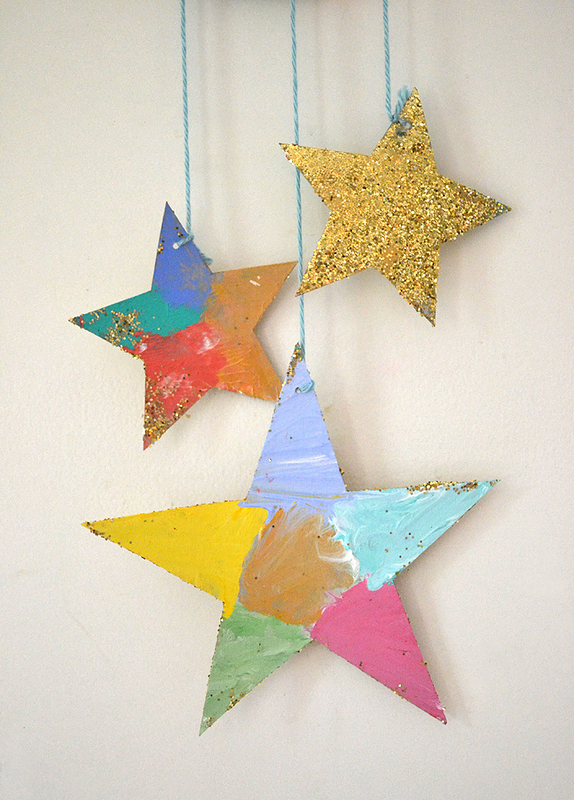 They were so excited and proud when all the parts came together to create these magical, sparkling works of dangling art. They just kept saying, “can we take these home now?” over and over. Enthusiasm and pride was overflowing! 1. To begin, cut the stars. 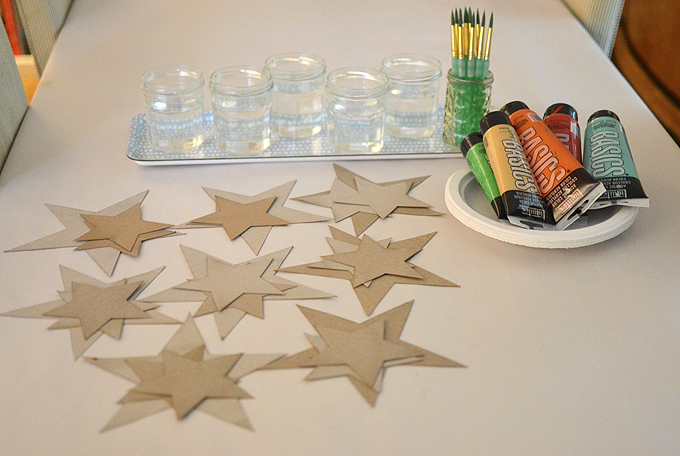 I just drew a little star and a big star freehand, then used them as templates to trace all the rest. If you need help, just print out the second picture of this post and use it as a template. 2. Next, I used gold spray paint to cover the printed side of the cereal box. 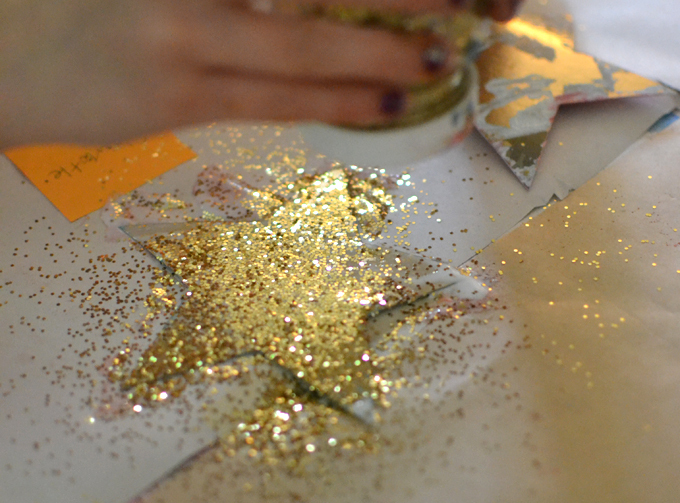 If you don’t want to do this step, you can skip it and just have the kids cover that side with glitter. It will look fine, even great, with a little color showing through. 3. I then twisted all of the hangers. 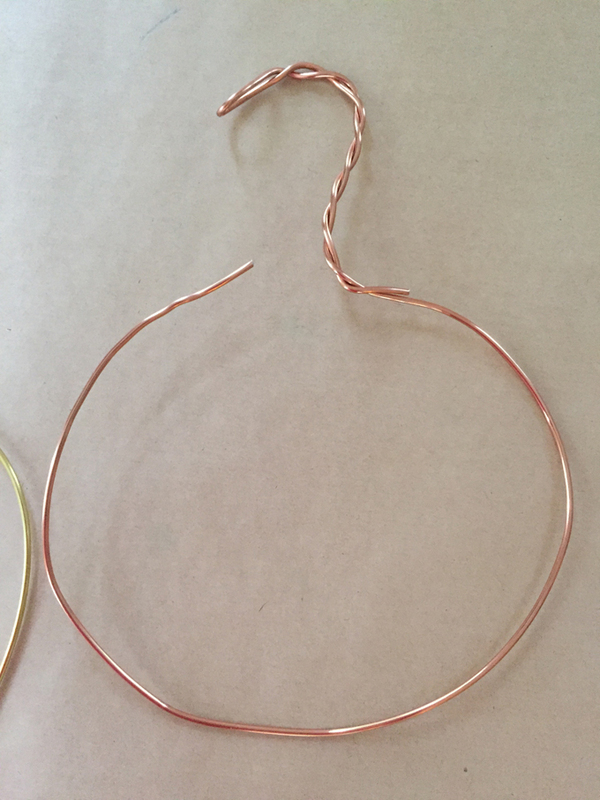 I cut about a 30-inch piece of wire, then bent it into a circle and added a hook. I left it open for the beads. 4. 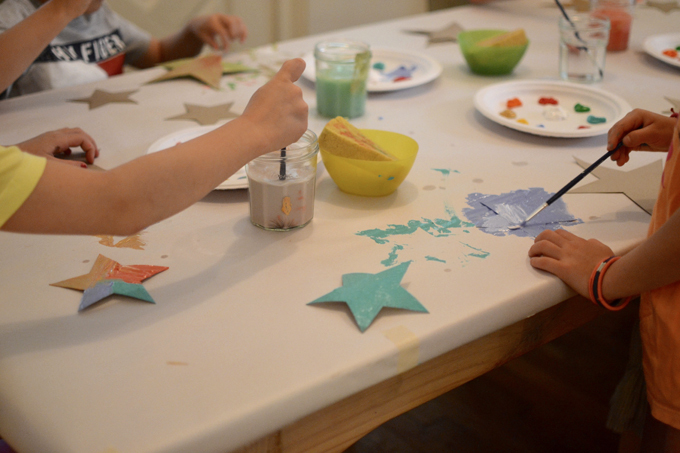 First, they painted the stars with acrylics (using the brown side). 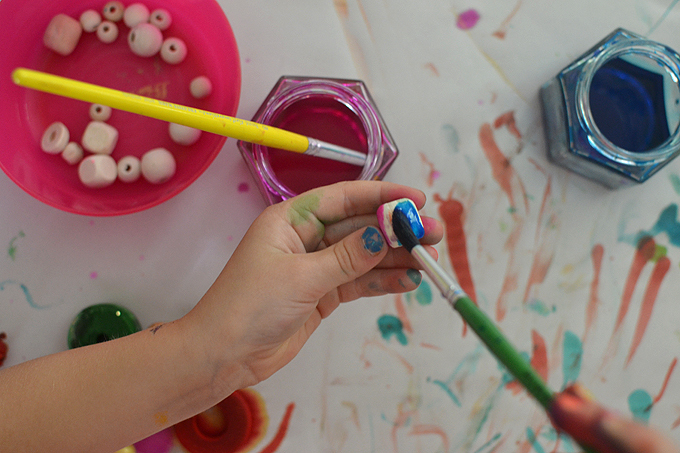 I encouraged them to use lots of colors, but everyone did something different, which I loved. 5. We let the acrylic paint dry overnight. 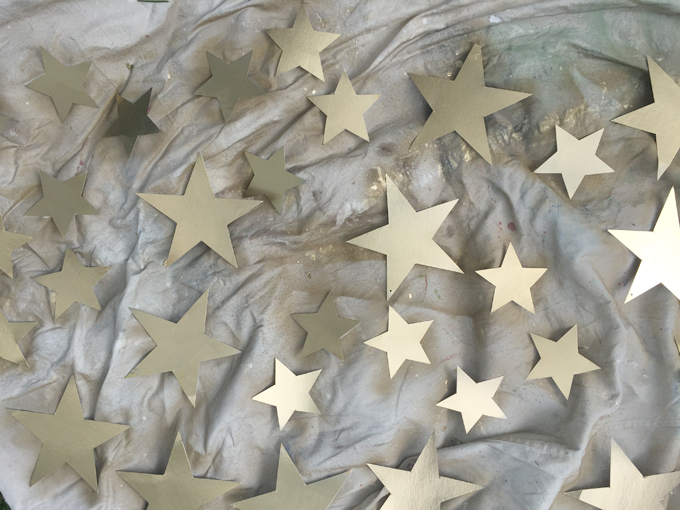 The next day, I gave them each a bowl of glue with a brush and some gold glitter, and they glittered the gold side. 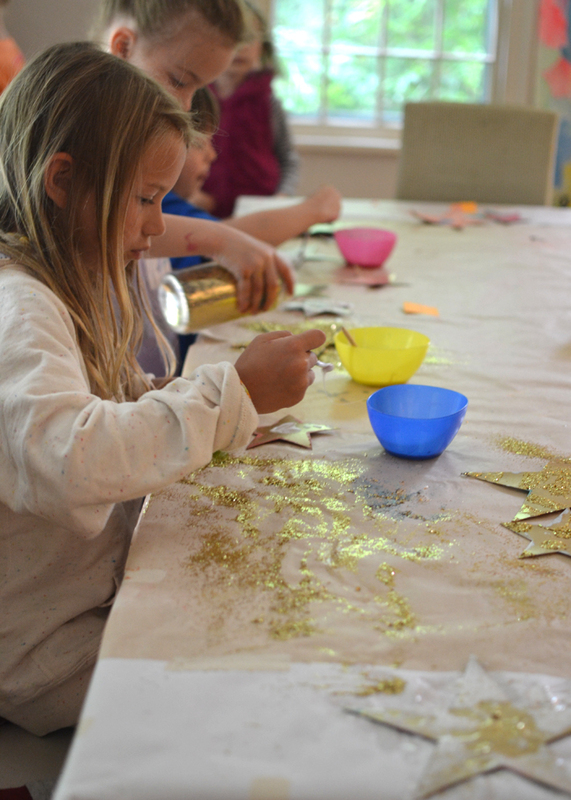 Some glittered the whole surface, while others made patterns with their glue. 6. 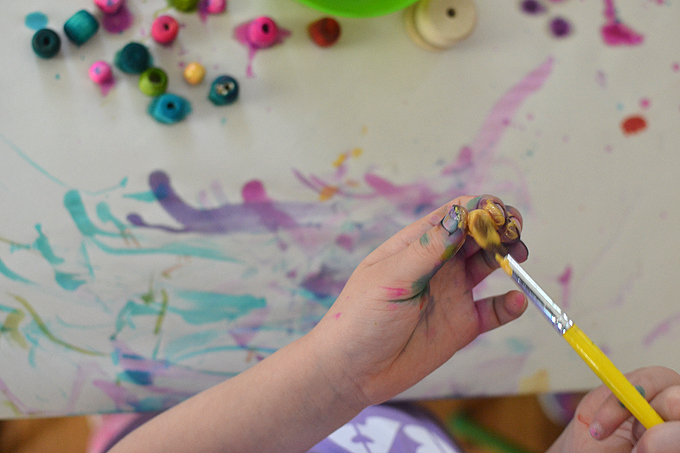 While the glitter dried overnight, the kids painted tons of wooden beads. We added some gold paint at the end for accents. They added their beads to the wire circle hangers, and I closed the hanger by bending back the wire around the top. 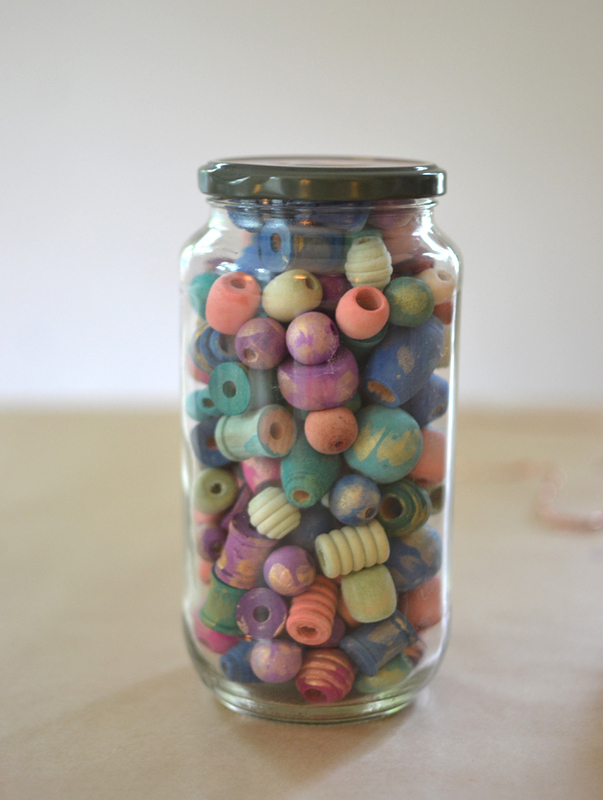 Want more projects using painted wooden beads? 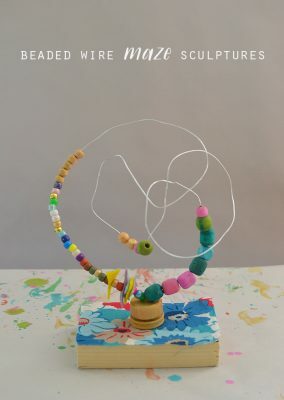 My friend Kim at Beehive Art used them to make these cool and very simple wooden bead mobiles. 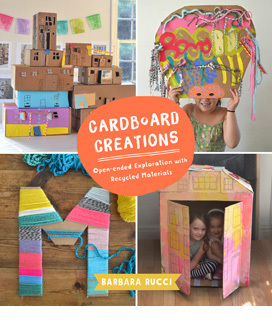 This project is great for toddlers. 7. 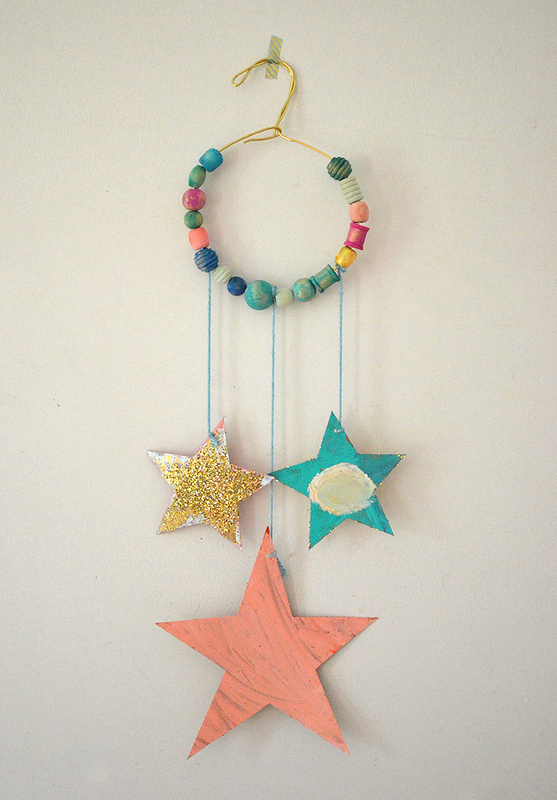 Finally, I hung the stars from the hanger with yarn. I debated for days (yes, I think about these projects in my sleep and for far too long than is normal) whether I should have them bead the strings too with some gold beads. 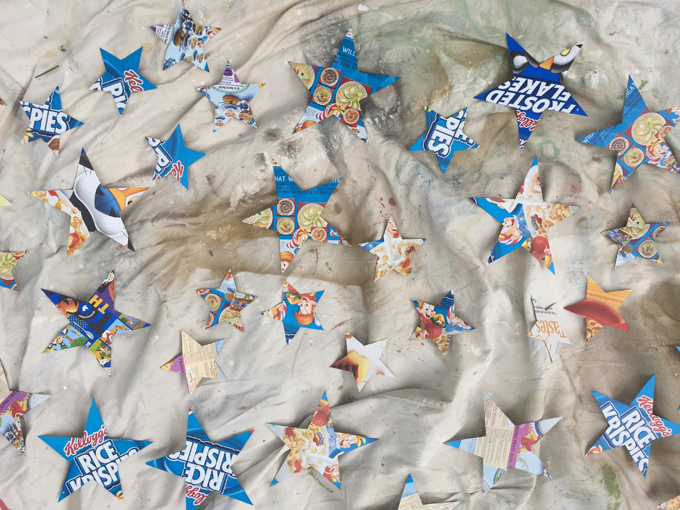 But in the end, I decided that there was enough going on, and I wanted the stars to feel floaty and not too heavy. 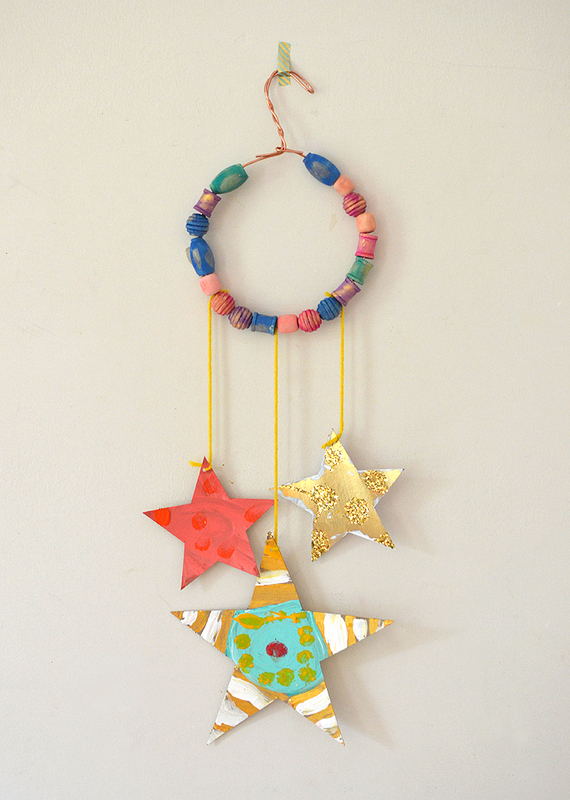 There are so many ways to make these mobiles. If you try them, I encourage you to add your own twist. And then share them with me on Instagram with the hashtag #artbarinspired, or just email me a photo. I would love to see! 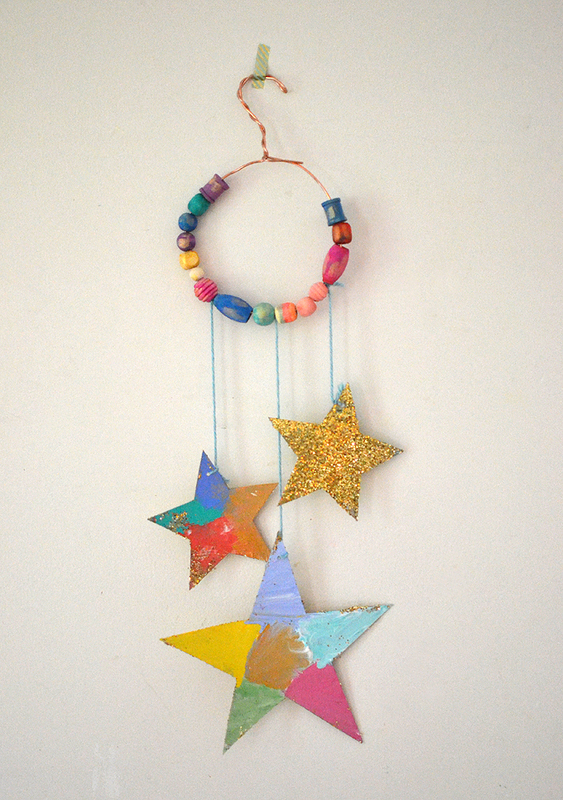 Are you curious to see our other mobiles and dangling art projects? Take a look at our leaf mobiles, our egg carton chimes, our paper mache mobiles, our wintery mobiles, our ribbon chandelier, our paper pinwheels, our dream catchers, and my favorite pom–pom chandelier. 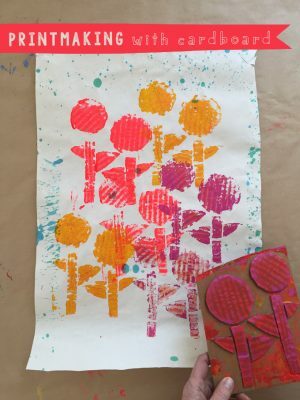 I love this diy!! 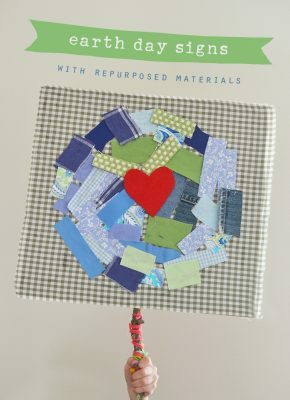 It’s so cute, and so easy to make for the kids to enjoy the project too! Love it! !